Great weather to enjoy a hike, bike ride or a quiet nature walk on the trails. 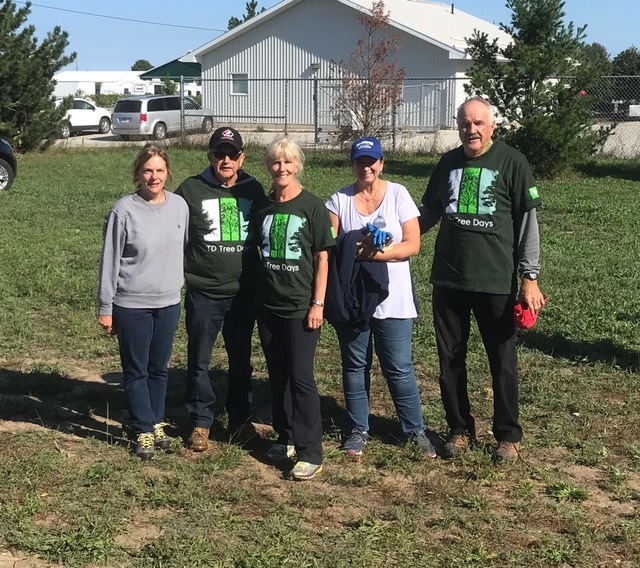 TD Tree Days had the perfect day on Sunday September 23 to plant 150 trees along the Saugeen Railtrail from the 10th Concession south to the Plex. 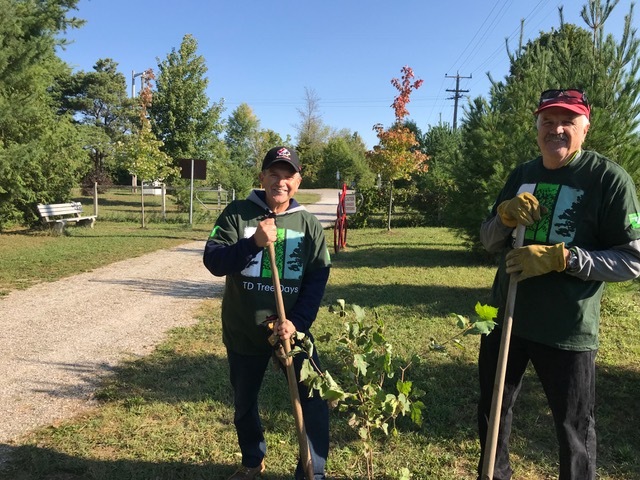 TD Bank purchased the tress as part of their TD Tree Days program from Saugeen Valley Conservation Authority. 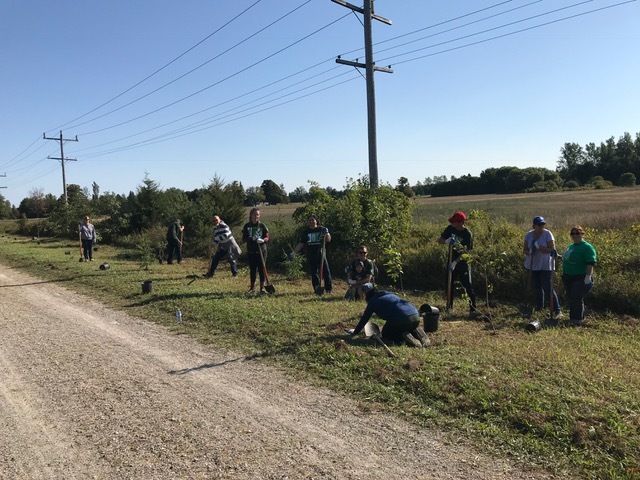 Together with Saugeen Railtrail Association the 3 groups provided volunteers to plant the various kinds of trees along the trail. The trees averaging in height from 2 feet to 4 feet will provide not only their beauty but a wind and visual screen. The Saugeen Railtrail is heavily used by walkers, runners and bicycles providing a safe linear parkway in Saugeen Shores. Roy & Ellen – Thank you again for introducing us to this trail a few years back. Our cycle club had our second annual Saugeen ride a few weeks back and it received enthusiastic reviews. The 34km route started at the Coliseum and we rode the rail trail from Southampton through Port Elgin, down Concession Road 6, picked up the Gore Drain Trail, across Concession Road 4 and onto the MacGregor Park trails to Sunset Point. The return journey was along the lakeside trails. A truly outstanding, spectacular and beautiful ride. Our cycle club is the Lighthouse Probus Club in Collingwood with 40 members and we cycle mainly gravel trails every Wednesday, May through October for 25-40 km. We do a number of local rides in the southern Georgian Bay area but also drive to places such as Midland, Caledon & Southampton. There’s lot’s of poison ivy growing along the Railtrail and all local trails. Weeds love all that rain. For more information about poison ivy visit Canada.ca – poison ivy. Note: Animals cannot get a rash but they can transfer the oil on their fur. All parts of the plant contain a poisonous resin Urushiol which causes the rash. Here is a picture of poison ivy to help you spot it in the wild. SRTA is looking to recruit members for a variety of board positions who have the skills, experience, passion and vision to continue to promote, develop and maintain our extensive trail system. This is a volunteer board whose members serve terms of 3 years with a maximum of 6 years consecutive service. If you are interested in learning more about this opportunity read our Volunteer Board of Directors Recruitment document. Family and friends gathered for the annual memorial ceremony at the Saugeen RailTrail Memorial Gardens at Peel and Grosvenor Streets. A new gazebo, funded through private donations and organizations, such as the Southampton Rotary Club, was also officially opened with a ribbon-cutting ceremony. As part of the Saugeen Shores application for a Bicycle Friendly Community Program, we have installed a basic bicycle repair tool set at the River Street Trail Head location. As you will note in the photos, this location also serves as a charging station for electric bikes and mobility scooters. This new equipment has been supplied by the Town of Saugeen Shores, Recreation Dept. All comments are appreciated. Work continues on the new accessible train station gazebo at the Saugeen RailTrail Memorial Garden in Southampton, located at Peel and Grosvenor Street. This will complete the “Trains to Ships” 25th Silver Jubilee projects began by the RailTrail in 2015. 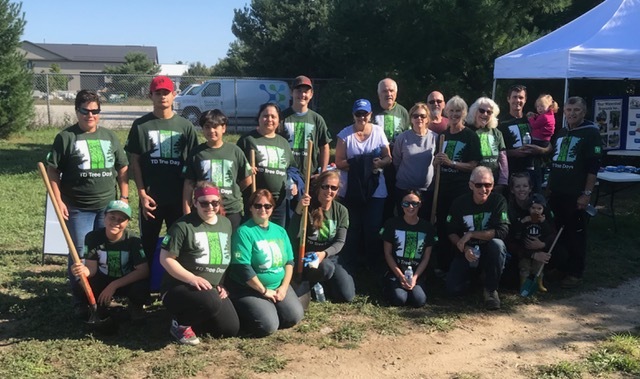 After 5 years of Mother Nature with her sun and weather, it was time for the RailTrail Train Station in Port Elgin to get a facelift. The station, located where the original train station once stood, was constructed by Saugeen District Secondary School (SDSS) students under the direction of teacher Bud Halpin. Once again, SDSS students stepped forward, and the station was given a fresh coat of paint by the “period 4 Technology Class” under the guidance of teacher, Howard Barker. Paint and supplies were provided by the Port Elgin Rotary Club. 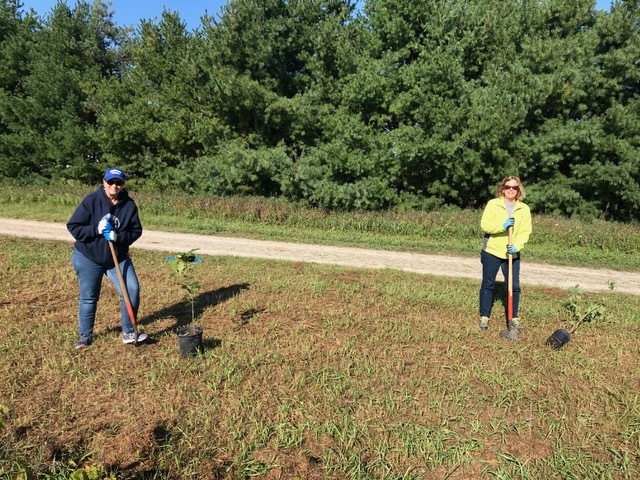 50 Red Blaze Maples were planted along the trail system to mark our 25th anniversary. We invite you to enjoy their beauty as they are now at their peak. In addition, the new Southampton Trail Station is in progress and you can see its development over the next couple of weeks. Thanks to many of your historical partners: J.C Hemming, Bruce County Museum & Cultural Centre-Archives, the Ambrose Zettler Family, Ken Thornburn, Elwood Thompson and donors: Tow of Saugeen Shores, Port Elgin Rotary, Dan Murawsky architect, teacher Bud Halpin and students of Saugeen District Secondary School, SRTA, Peter and Jill Gauthier owners of Port Elgin Home Hardware, Bruce Telecom, Chantry Island Chamb-etts, Super 8 Motel, South Port Horticulture, Ontario Power Generation, Martin’s Bicycle Shop, Jeff Ackert Construction, and many more.